This small kit is ideal for repairs, installing bathroom fixtures, replacing tiles. Ideal for the contractor to have on the “back of the truck” or in the shop. LATAPOXY 310 Rapid Stone Adhesive is a 2-component, rapid setting, high-strength construction epoxy adhesive for spot bonding large format tile and stone on vertical surfaces, for interior installations and approved exterior applications. 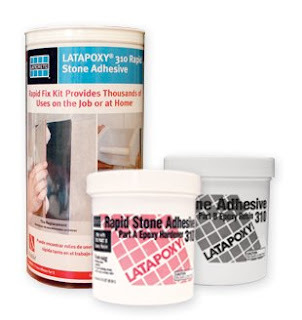 Beyond its primary purpose, LATAPOXY 310 Rapid Stone Adhesive has become a “fix all” product for contractors nationwide using it for installing bathroom fixtures, replacing tiles and numerous other applications that require an adhesive with a remarkably strong bond. Read about our family of Epoxy Adhesives here. LATICRETE PermaColor Grout solves the most common problems associated with tile and stone. Just one grout for both floors and walls, consistent color regardless of application or clean-up technique, varying substrates or multiple types of tile or grout joint sizes on the same job. Step up to PermaColor today! OK, so when is receiving an email from a contractor a "bother ...?" " .... I know I said I wasn't gonna bug you anymore but wanted to say thanks for the pocket reference guide you sent me. That will save you a lot of my questions via PM's. Anyway thanks again ... Take Care"
"You are NOT bugging me ! I make my living dealing with, listening to, responding to, contractors ! Remember to call Laticrete Technical Support when you have have questions (or PM me !) 800 243-4788 ! ps - thank you for your email! ps - I may put your email and my response on my Blog, if that is ok with you ?" OK, so I'm getting with it. Or something like that. I've been having an email conversation with a tile installer over the last day or so regarding liquid applied waterproof membranes vs. sheet applied membranes. I've offered him some of our Laticrete HydroBan to try. "I had been thinking of going to a rolled on membrane like Hydroban instead of poly behind the board but was under the assumption that one coat was fine but now just learned that it requires two coats, I'm leaning to think that this could be time consuming if you have to come back the following day to give it a second coat and then wait around till it dries before you can start tiling. My thinking for a while now was that a surface applied waterproofing is a better way to go but been doing the poly for so long now i just never tried a full roll on shower. Any thoughts?" "Over most surfaces Laticrete liquid applied membranes dry fairly fast! 1 - Paint apply membrane. Allow to dry until dry to the touch - usually 20 to 40 minutes. 2 - Apply 2nd coat liquid. Allow to dry to the touch. Often less than an hour or two. 3 - Start tiling ! In many cases this not a "come back tomorrow" processes ! We say 2 coats of liquid for "insurance" because no one puts "perfect" 1st coat of liquid on ! And 2nd coat makes sure that everything is watertight / waterproof. We are conservative to protect you and your reputation! Many tile guys swear by, not at, our waterproof membranes and have field proven performance and speed of installation of our Laticrete liquid applied membranes for 20, 30, 40 and more years! I have good friends who are 3rd generation tile ctrs using our membranes ! Want to chat with one of them ? Laticrete liquid applied waterproof membranes have some tremendous advantages such as no seams to leak !" "I have another shower to build in about a week where i think HydroBan might work out better than poly,(a shower ties into a tub deck).If we are only talking 20 - 40 minutes that's not a problem, i thought you might have to let dry 12 hrs.As i said i have been pondering the idea of switching to a surface applied membrane for some time now but have never taken the jump , this might be a good time." What do YOU think ....? How big a piece of Stone can be Installed …? How big a piece of Stone can be installed with Laticrete? On Walls? On Floors? On Facades? Laticrete technical representatives will tell you about our Singapore people putting 4' by 4' (1200 x 1200mm) pieces of Granite onto an exterior facade, with no mechanical hooks, with Laticrete 4237 latex PC adhesive mortar. Our technical people will tell you about 3' by 3' (900 x 900 mm) pieces of Travertine on the Facade of a bank. Again with No mechanical hooks or anchors! A serious question that must be raised is "How secure / strong" is the subsurface to receive the Stone? Will IT support the Stone? In most cases, the limitations we run into ARE NOT Laticrete limitations! If an architect wants to install it, if the wall or floor is properly designed to carry the weight, then We Can Install it with Laticrete. Safely. Securely. We DO run into legal limitations in certain cities. Please DON'T confuse legal limitations with technical limitations regarding the capability of Laticrete! Installations of (very) large pieces of Granite, Marble, Travertine have been made without mechanical hooks from Singapore to Pakistan to London to Norway to throughout North America for the past fifty plus years using Laticrete! Want to know more ...? Send me an email ( hbrothberg@laticrete.com) and I'll send you a copy of our "White Paper" on this subject. We're committed to education, to training. Last night over dinner, after yesterday's training sessions were over, I had the OPPORTUNITY to sit with tile contractors, remodeling contractors, bath & kitchen showroom people and chat. It is amazing what one can learn from people "in the field..!" About their businesses, about the economy, about construction. About opportunities. Read more about our Laticrete educational programs for tile people here. I received an email this morning from a contractor who provided some incredibly detailed feedback regarding a range of Laticrete products he had recently used. He was concerned that he might be "knocking our products" in some of his feedback. “knocking our products …?” Huh …? You have taken an incredible amount of time to provide incredibly detailed feedback to us. And for this I thank you…! We need comments and feedback from contractors and tile installers. We NEED to know what real users of our products feel .. and how and where they use our products. We want to hear from users and specifiers of our products and services. We want to hear what you think and how you feel about Laticrete - our products, our services, our people. We need and want to hear the "the good, the bad, & the ugly ..! Sometimes we get to be involved with some really beautiful tilework. 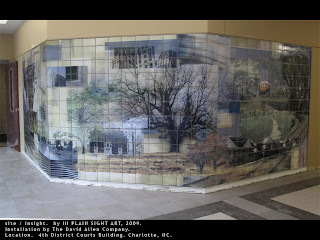 Such as this tile mural at the Courts Building in Charlotte, NC ...! I went fishing two weeks ago with some tile people in the Bahamas. 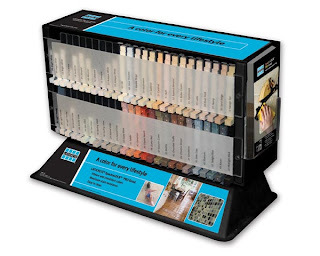 A new Laticrete Grout Display is available. "I want one - a new Laticrete Grout Display for my showroom." Conventional Portland cement mortar beds, thin-set mortars, cement plasters and stuccos are often permanently damaged when subject to hot, dry temperatures or desert climates immediately after installation. High temperatures remove the water content of the mortar required for Portland cement hydration, curing and strength development. In addition, rapid drying often causes mortar to crack, crumble or lose bond. Waterproofing membranes, anti-fracture membranes, epoxy adhesives, epoxy grouts, waterproofing membranes and many other tile & stone installation products will also be affected by hot working temperatures. Flash setting and reduced working time can result. It is important to note that surface temperature is more important than air temperature. Therefore, monitor the surface temperature of the installation. Click here to see a GREAT tool to do this. The 18º Rule – for every 18ºF above 70ºF (10ºC above 21ºC), Portland cement and epoxy based materials take half as long to cure. In October, 1995 the London Underground Limited (LUL) Technology Services conducted an extensive “Assessment of Fire/Smoke Characteristics” of the LATICRETE® and LATAPOXY® Products in accordance with the London Underground Code of Practice ‘Fire Safety of Materials Used in the Underground’. Their conclusion: All the products fully comply with the smoke and toxic fume emission requirements of the LUL Code of Practices. All metros and subways (like other confined, occupied spaces) utilizing ceramic tile and stone require installation materials that meet stringent fire/smoke/toxic fume limits. LATICRETE® and LATAPOXY® Products have been proven by laboratory testing and time-tested installations around the world to provide superior levels of fire safety. Throughout its existence, LATICRETE has enjoyed the freedom of action and dedication to purpose brought by being a privately owned enterprise. Being able to ignore the short term, often unrealistic, demands of the stock markets or equity speculators, allows us to provide industry leading levels of product innovation, customer satisfaction and corporate citizenship. By heavily reinvesting our earnings into superior research, customer support and manufacturing capabilities, we continue to build long term value despite fluctuations in construction activity and evolving market needs. The commitment of our owners to provide robust client service is unwavering and reflected throughout our organization. What do we sell / offer? For the Architect, Contractor, Owner, Tile & Stone manufacturers we offer "Peace of Mind." We offer confidence. When (expensive) tile or stone is installed with doubtful quality or marginal performance or unproven mortars a strong potential exists for problems! We offer first quality, high performance, field & laboratory proven materials. We reduce the potential for problems. We offer "Peace of Mind... We offer Confidence ...." We offer complete installation systems that are backed with a comprehensive warranty covering the replacement of labor & materials from a company who is known world wide for quality, performance & experience. For the Tile Distributor / Tile Shop we offer "Peace of Mind." We offer confidence. We offer Profitability. We offer materials that all of their competitors are not selling! We offer materials that the Tile Distributor / Tile Shop can promote and sell and not have to compete with every other Tile Distributor / Tile Shop who is selling the exact same product! For these people we also remind them that when (expensive) tile or stone is installed with doubtful quality or marginal performance or unproven mortars a strong potential exists for problems! Who are we? what do we manufacture? We do not (just) manufacture grout or adhesive. We manufacture High Strength Installation Systems & Materials for the Permanent Problem Free Installations of Ceramic Tile and Stone. Do do this on a Global basis. 9. We issue a written labor and material warranty on the whole installation that encourages owners and architects to use your tile. 18. We prepare custom specifications for proper installation of tiles. Beware the dangerous (and useless) 'Screwdriver' test! Over the years we've received reports from the field regarding contractors who tested mortars by "trying to pry a tile up with a screwdriver"
This is NOT a realistic or accurate test of the performance of a mortar! We've had contractors comment that "... the tile come up easily ..." or "... the tile came up clean ..."
I REPEAT: This is NOT an accurate test of a mortars performance. The fact that the tile come up only shows the massive force that can be exerted with a "lever" You may remember from high school physics that Archimedes said " give me a long enough lever and a place to stand and I'll move the Earth!" And he was RIGHT! The fact that the tile came up "clean" only indicates that the bond of the mortar to the subsurface and the INTERNAL strength of the mortar was stronger than the bond of the mortar to the tile. This in NOT necessarily bad! Remember that if you take a 5,000# strength chain and pull with 6,000# pounds of force the chain will break at one of the links. This DOES NOT mean that the broken link was weak or "bad"! It only means that it broke after its strength was exceeded! OK, So who is Laticrete ....? Laticrete International is responsible for the development and introduction to the construction industry of thin adhesive mortars for bonding ceramic tile and stone. The company was founded in 1956 by Dr. Henry M. Rothberg who is a chemical engineer. He was interested in bringing the improvements of chemistry to the normal Portland cement based installation systems for tile and stone. The pioneering work in this area done by Engineer Rothberg is the basis for all modern adhesives used today for the installation of tile and stone by the Adhesive Mortar Method. It was during the late 1940’s that the use of Portland cement based adhesive mortar technology sparked the interest of a young chemical engineer in the United States. Henry M. Rothberg was managing a family tile, terrazzo and marble installation company when the problems inherent to installing these materials with the traditional “full mortar bed” became more and more evident to him. He decided to dedicate himself to research into alternate methods of installing ceramic tile and stone. LATICRETE revolutionized ceramic tile and stone installation techniques. The new material piloted the opening of the ceramic tile market towards new horizons. LATICRETE mortars were suitable for use in installing tiles of all types, including difficult products such as glass mosaics, and in difficult situations such as exterior facades and swimming pools. LATICRETE mortars resolved problems inherent to installations in climate zones subject to freeze/thaw as well as to physical and thermal shock. In the 1950’s, it was a difficult mission to convince users that Portland cement could be mixed with a liquid rubber to make a strong, durable adhesive mortar with all of the waterproof characteristics of Portland cement yet some of the flexibility and other benefits of adhesives. The new latex fortified Portland cement adhesive mortars would cure in thin applications, yet provide higher bond strength as well as the ability to resist thermal shock, physical vibration and all the ravages of wind, rain and frost that various climates could produce. After years of diligent promotion and education the construction industry was finally ready to recognize the benefits of the Latex Portland Cement Adhesive Mortar technology. As awareness and acceptance of this truly problem solving technology spread, so did the growth in the global acceptance of Ceramic Tile and Stone for flooring and facades. When industry standards for the installation of ceramic tile and stone were established in many countries, they were far below the capabilities of the Laticrete System Materials. The Laticrete standards remain the highest in the construction industry today, actually 200 to 400% above the national standards of most countries. There is only one company that has been continuously involved for over 50 years in the development and production of ceramic tile & stone adhesive mortar materials and technology and has earned the reputation for industry innovative technology - LATICRETE INTERNATIONAL. • Laticrete System Materials are marketed in over 65 countries around the world. • Laticrete International was the first organization in its industry sector to receive the ISO 9001 certificate. • Laticrete System Materials have been job proven around the world in a wide range of extreme climate conditions for over 50 years. There is a terrible misconception that "Acid Washing" will remove sealers or curing compounds from concrete slabs. Acid will not clean or remove grease and oil and acid will not remove many types of curing compounds and sealers. One way to remove grease and oil is with a strong detergent (TSP found at paint or hardware store) or floor stripper (this is available from janitor supply companies). Another way to remove concrete sealers & curing compounds is to mechanically remove them by grinding, sanding, scarifying, sand blasting or high pressure water blasting. We DO NOT recommend or approve "Acid Washing" as a method to prepare treated or sealed concrete prior to thin bed installation of tile. Many problems can arise when the contractor tries to 'Acid Wash' a concrete slab to remove curing compounds, grease or oil before installing tile and stone. We do NOT give an approval or the IMPRESSION of an approval for this 'Wash the concrete slab with Acid' technique. We do NOT recommend "safe" acids such as Sulfamic acid for removing grease, oil or curing compounds! Note: Occasionally a contractor asks about using Acid to "etch" a concrete slab before installing tilework to "get a better bond." Do NOT recommend this procedure! It will etch the concrete surface. Do you really want to install/bond tile over an etched & weakened, concrete surface? NO! Not only does the acid weaken the surface of the etched concrete, the acid will remain within the concrete ( neutralizing is never 100% - who on a jobsite does a thorough neutralization?? ), and weaken any cementious adhesive applied over this substrate. OK, So now I have a blog ... about Laticrete, about tile & stone installations.